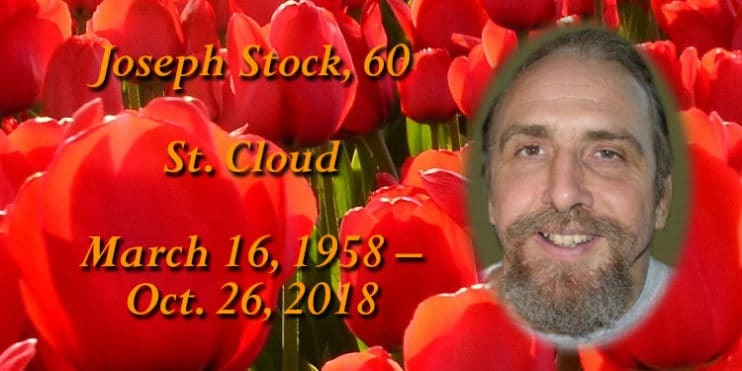 Joseph Sylvan Stock died peacefully, with family at his side, at the St. Cloud Hospital on Sunday, Oct. 21, 2018. His funeral will be held at 11 a.m. Friday, Oct. 26 in St. Michael’s Catholic Church, 1036 Co Rd 4, St Cloud. Burial will take place in the St. Joseph Parish Cemetery in St. Joseph. Visitation will be held from 4-8 p.m. Thursday, Oct. 25 at the Daniel Funeral Home, 1010 Second St. N., St. Cloud. A prayer service will be held at 7 p.m. Visitation will continue one hour prior to service at the church on Friday. Survivors include his siblings: Jim (Sandy) of Fergus Falls, Kathy (Joel) Berglund of Bemidji, Ken of St. Cloud, Kevin (Teresa) of St. Joseph, Karen of Duluth, Gary of St. Joseph, Pete of St. Cloud, Paul (Lisa) of St. Joseph, Geri of St. Joseph, Jackie (Neil) Marthaler of Blaine and Tony of St. Cloud as well as many nieces, nephews and friends that became family.